Larke Peak at the elevation of 6249M lies in the Manaslu region and combines with the Manaslu circuit that has been opened post the massive earthquake in 2014. Since there are not many visitors in the region, the natural beauty along with the diverse culture and tradition in the region is still untouched. This 20 days trek to Larke Peak starts from Arughat Bazaar and takes us through the Larke Pass (5420M) which is also a route to the popular Manaslu circuit trek. 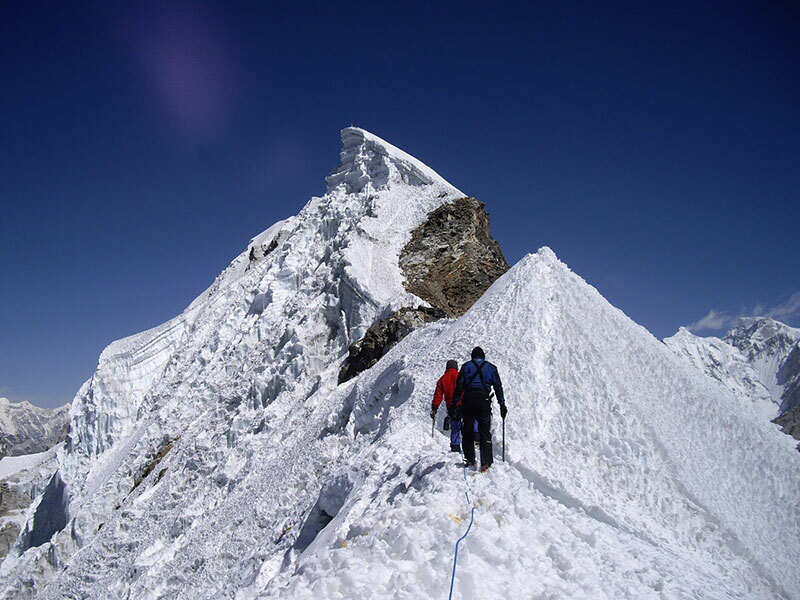 Larke Peak itself is the technical mountain that requires fixed rope and jumers for steep climbing. 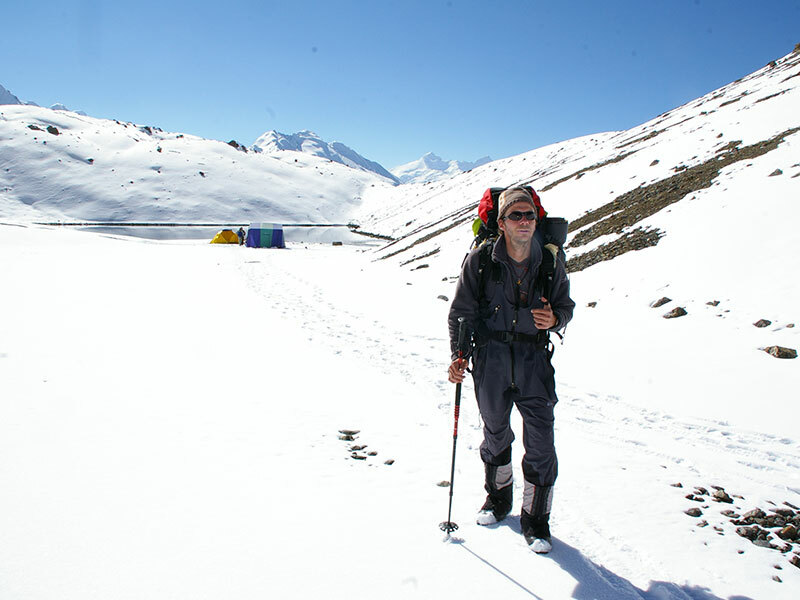 Trek through the rich biodiversity and less visited region of Manasalu passing through Larke Pass at 5420m. Amazing Himalayan range with the cultural diversity and nature with interesting glacier lakes along with flora and fauna. An early morning breakfast and we head towards Arughat through the paved road from Kathmandu until Dhanding Besi. We take a right crossing the road through a bridge and head towards Arughat that is a major trade center for Gorkha. We drive further to Macha Khola from where we trek upto Dovan today. We will walk along the Budi Gandaki river until our final destination of the day, Dobhan. As we cross through several steep section open to the river while passing through herds of mules, it is important to remain on the wall side to avoid being pushed away by the mules carrying the loads. We arrive at Tatopani, a small hot spring from where we cross the Budi Gandaki River through a suspension bridge. From here, we continue towards Dobhan. Today, we cross several suspension bridge along with the bridge like structure which is attached to the wall of the rock before we reach the village of Jagat. As we arrive at Jagat, we will notice the large cliff on both sides. A gate painted with "Welcome to Manaslu Conservation Area" welcomes stand visibly. After our guide takes care of the permits at the first checkpoint in Jagat, we continue our trek through the rocky ridge and several bridges. As we cross the bridge after Sirdibas village, we take a straight uphill all the way to Philim. The village has a beautiful school built by Japanese which you can visit on your leisure time. After our guide takes care of the permits at the checkpoint, we continue our trek through the rocky ridge and several bridges. We see a beautiful village Philim right next to the Budi Gandaki. Crossing the suspension bridge, we take a straight uphill all the way to Philim where we stop over for lunch. The village has a school built by Japanese that you can see while the lunch is being prepared. After lunch, we continue through the trails that pass through the village of Ekle Bhatti. After crossing the narrow ridge and narrow trail we arrive at Deng that has few hotels. We will spend an overnight here. The trail today passes through the forest and Mani after heading west from Budi Gandaki. Crossing Budi Gandaki several times we encounter several monasteries along the way. As we enter the epic section of Manaslu. Crossing few other settlements we arrive at Namrung that is located next to the Budi Gandaki River. You can take a walk around the village to visit the monastery. The early morning greets you with the sunrise over Siring and Ganesh Himal and Himal Chuli in the south. Considered as one of the best parts of this trip because of the local people here and the view of Manaslu from Lho. We continue uphill through the forest and cross the Buri Gandaki river. As we ascend we leave the treeline with more visibility of the mountain views. We continue our walk towards Lho, a small village that is complimented by the prayer flags. We till trek to Sama Gompa today passing through the stone gate and Mani walls as we cross Lho as we are greeted with a full view of Ngadi Chuli ahead of us making a side trip to the Pungen Gompa. We walk for another 20 minutes after we reach Sama Gaun to reach Sama Gompa where we spend our overnight. We will be staying one more overnight in Samagoan today. For those who wish to visit Manaslu Base Camp, it is better to start early. We trek through the steep section to Manaslu Base Camp. Another option can be to visit the Pugyen Monastery which is about two and half hour hike with the trail passing through a school that we had passed yesterday. At the monastery, the monks will offer us some tea. We walk back to our lodge for the overnight. Today is relatively a short walk passing through Birendra Lake and heading northwest of the valley as we encounter the chortens and mani walls along the way. We arrive at Samdo in about 4 hours after which you have the rest of the day to yourself. A short walk from to Dharamsala from Samdo takes about 5 hours. We cross a wooden bridge as we start ascending from here. Along the way, we can witness the Larkya Glacier. We continue climbing as we arrive at a guest house in Dharamsala which is also known locally as Larkya Phedi, there are some isolated tea houses. We move towards the high camp today early and set up the camp at high camp for the final summit push the next day. A very early start today for our final summit push to Larke Peak at 6249M. The view of the Manaslu range will be a reward from the summit along Manaslu North (7157M). We will descend back to the base camp after the summit. 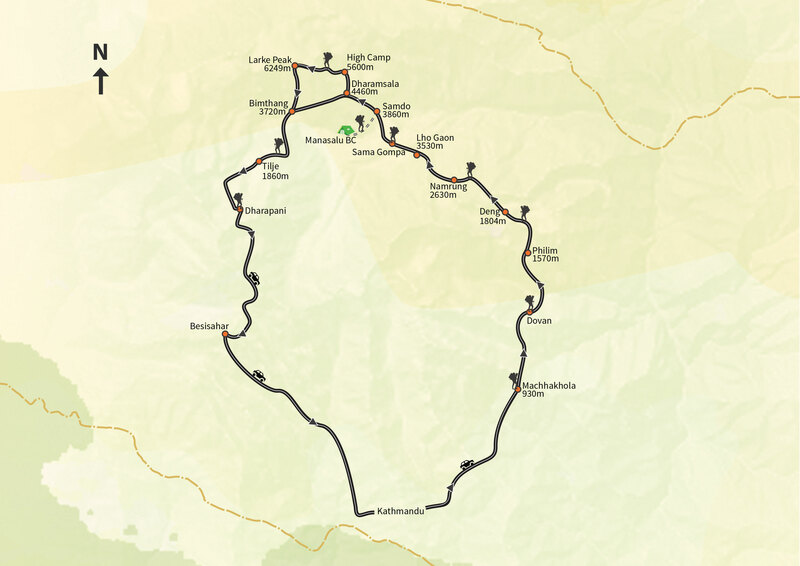 Today can be regarded as one of the most challenging days of the whole trek. After climb for a short while, we get spectacular views of Larkya Peak and Cho Danda. As we ascend towards the trails becomes steeper. We are greeted with amazing views of HImlung, Cheo and Annapurna II from the pass. We continue our towards Bimthang from here with the view of Manaslu. As the hard part of the trek is over, we head towards Dharapani where the trail passes through the dense forest and fields slowly coming into sight. Arriving in the Manang district, we are in the restricted part of the Manang after Nar Phu. We continue our trek further down to Tilje. The last day of the trip, we start up early following the trail to Dharapani. The Marshyangdi valley can be seen with the terraced fields and villages as the trails descends through the forest of pine and rhododendron that ultimately leads us to Syangje. Once we arrive in Dharapani, our vehicle will take us to Kathmandu via Besi Sahar which takes about 8 hours drive to Kathmandu. We will check into our comfortable rooms and enjoy the hot showers and freshen up. Depending on your flight time, our airport check in is 3 hours prior to the departure time and the hotel checkout time is 12PM. In case our flight is late evening please let us know if you require half day use of the hotel. This tour spends three nights in a hotel in Kathmandu and ten nights on the trek in lodges (tea houses) and tented camp while on base camp and high camp of Larke.